Preface. Migration and Culture Contact. Outcomes and Predictors: An Overview. Environmental Stressors and Facilitators. Demographic and Background Characteristics. Cultural Skills. Family Relations. Personality Characteristics. Summary: Predictors of Adaptive Outcomes. Appendix 1: Design of Studies. Appendix 2: Scales from Questionnaire. References. 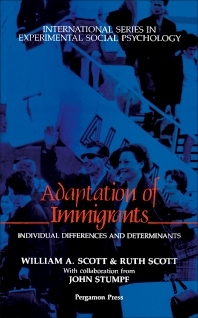 This volume surveys studies conducted in the major immigrant receiving nations over the past several decades to ascertain the main established correlates of immigrant adjustment. It also reports findings from an original longitudinal study of immigrants to Australia from several European countries. Among the questions addressed are: What is the usual course of immigrants' reactions to their new country? How do these reactions differ depending on their focus of concern - self, family, friends, job, etc ? Are subjective reactions (satisfaction with various aspects of their lives) parallelled by objective measures of role performance ( adequacy of adaptation in the eyes of other people)? How are these reactions associated with other characteristics of the immigrants - personality, family relations, demographic and background characteristics? For undergraduates and postgraduates in psychology, sociology and social work, and scholars and professionals concerned with immigrants.